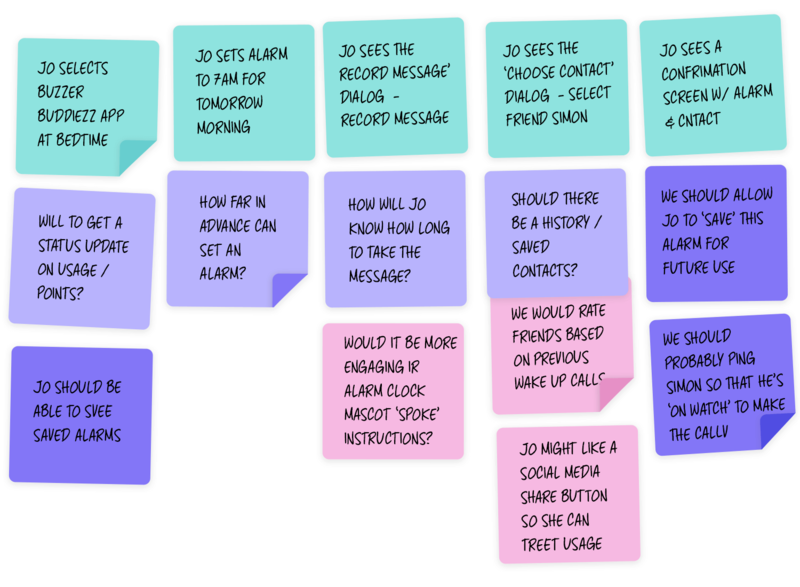 Personas, scenarios, user stories and storyboards: what’s the difference? User research in UX isn’t always easy. Yes, it’s an essential part of user-centered design because it ensures that we serve our users’ best interests. But because there are tons of research resources and techniques out there, it’s easy to get tangled up in them. In order to put these techniques to good use and strengthen the design process, we need to understand our options. This Justinmind link post delves into the what, why and how of four top UX research techniques. You’ll come away with everything you need to start putting user experience research in its rightful place in your design process. A user persona is an archetype or character that represents a potential user of your website or app. In user centered-design, personas help the design team to target their designs around users. Personas have been around since the mid-1990s in marketing. Now they are an integral part of the user experience research phase of software development. In user research, UXers will gather data related to the goals and frustrations of their potential users. Then, they create personas to put that data into context. There is usually more than one type of user who will interact with your website or app, and creating personas helps to scope out the range of users. See an example of a persona here. For UX teams, introducing persona development into the design process helps them learn about the spectrum of goals and needs of their users. A designer’s checklist if you like. Upon observing users, UXers split up the test data into possible user archetypes, or user personas. Then all this information is put into context in a user persona template. Remember, designers can only respond to their users’ needs once they know what those needs are. A user story is a short statement or abstract that identifies the user and their need/goal. It determines who the user is, what they need and why they need it. There is usually one user story per user persona. As we touched on above, there are often multiple user personas – it’s a good thing that user stories are brief! As Jed Bru Baker has it, stories are at the center of the user experience. Why? They put things in context and focus on the ‘holistic’ rather than the ‘artifact’. User stories help to document practical information about users, such as the different needs and motivations for accessing a website or app. They also help the development team estimate a roadmap needed to deliver the end product. A scenario is a situation that captures how users perform tasks on your site or app. Scenarios describe the user’s motivations for being onsite (their task or goal) and/or a question they need answered, and suggest possible ways to accomplish these objectives. It is essentially a development of the user story, and can relate to multiple target users. However, scenarios can also be broken down into use cases that describe the flow of tasks that any one user takes in a given functionality or path. For example, a scenario could outline how John uses a mobile app to buy a ticket to a design workshop whilst on his way to work. Scenarios help stakeholders envision the ideas of the design team by providing context to the intended user experience – frequently bridging communication gaps between creative and business thinking. For the design team, scenarios help them imagine the ideal solution for a user’s problem. Scenario planning starts with scenario mapping. The design team, developers and product owner will meet to exchange ideas and create a strategy based on their user personas. With the primary user defined through persona development, they can now consider the key task that the user hopes to achieve. The next step is to perform a scenario analysis, put the user’s goals into context and walk through the steps that the user would take. A storyboard is a visual representation of how the user would react with your site or app. There are different types of storyboards that designers can create: sketches, illustrations and screenshots, slideshows and animated, live demos. The technique was developed by Disney Studios for motion picture production in the 1930s. 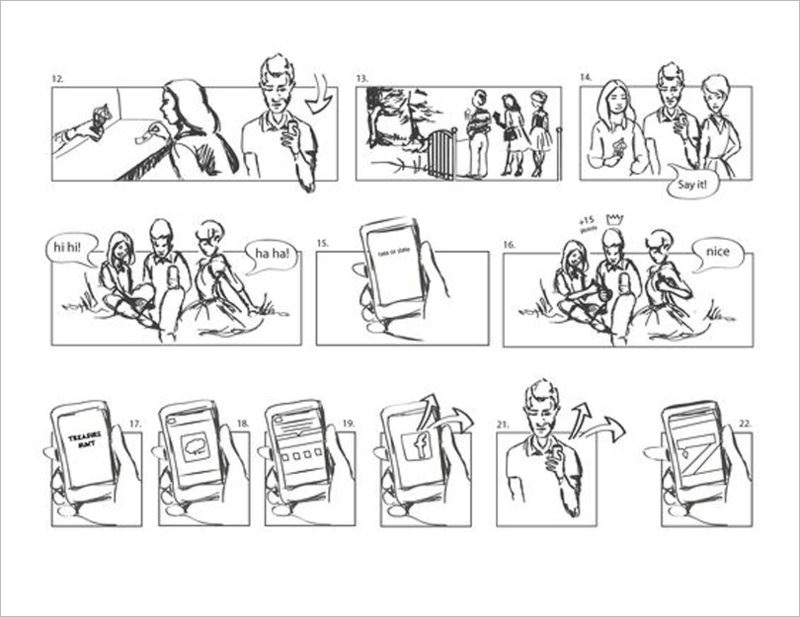 As Nick Babich has it, storyboarding helps you “visually predict and explore a user’s experience with a product”. Storyboarding is a great way to communicate design ideas to teams, stakeholders and end users visually. As with high-fidelity prototypes, visualizing a design idea with an interactive storyboard will help the audience remember as well as empathize and engage with it. To create a storyboard, you’ll need to set the scene, defining your character, or buyer persona, environment (where the persona finds themselves), and plot (what they want to achieve). Then, you can start to sketch out the initial idea for each scene, and build them up with as much interaction as you like. Using a prototyping tool like Justinmind is a great way to create storyboards – both for static designs and interactive animations. User research is the first step in designing around your users. But if you don’t document the data, then what was the point in doing it all? Engaging in user persona, user story, scenario and/or storyboard development will help you to identify key information about your users and build products that will delight your users time and time again. Everything we do to get closer to users is a step in the right direction.